The Star Book Ten controller is available for purchase as a standalone item only to upgrade the SX2 mount. It is included as standard with the SXD2, SXP, AXJ and AXD mounts and is not backwards compatible with the Star Book controller supplied with Vixen’s previous generation SX and Atlux mounts. 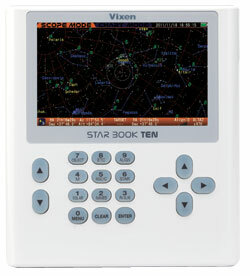 This latest generation of Vixen’s computerised GO-TO controller is named Star Book Ten* and has been designed to guide you to a database of more than 270,000 objects in the sky as quickly and easily as possible. The new controller includes many new features as well as a host of updates and improvements to the existing Star Book platform. One of these new features is the so-called “see to” system which shows a preview of a chosen object on the controller screen before the GO-TO sends the telescope to that object. The controller has an LED-backlit 5” LCD display with 0.3 megapixel (800x480) wide format resolution. Combined with the onboard 2D graphics acceleration of the Renesas SH7764 processor, this means that Star Book Ten delivers fast and smooth scrolling with clear graphics and text at all zoom levels. The addition of a night vision mode and red keypad backlighting make this a truly observer-friendly controller. The keypad and screen backlight levels can be controlled independently. The LED backlighting of the LCD panel means that the screen can be “deep dimmed” to allow full colour display use whilst protecting the user’s night vision. This allows the user to start and stop either an imaging or observing session by simply switching the mount off and on again. The hibernate mode works only if the mount is not moved and the two axes are not manually repositioned. A database of more than 270,000 celestial objects including Messier, NGC, IC objects and the SAO star catalogue is built in and can be searched by name or number. User defined objects including comets and artificial satellites can also be added. Whilst Vixen includes an individually adjusted RA PEC at the time of manufacture, the controller allows the user to add an additional layer of mount training data for the RA and DEC axes. The motion of the moon, the sun, planets and comets can all be tracked. Star Book Ten includes data on the most popular artificial satellites including the International Space Station (ISS). Other objects can be added to the database by the user. To provide added features for the serious astro photographer, the controller can accept an optional expansion board. This includes a PAL/NTSC video input which can be used to take still or video images to a memory card in the onboard SD card slot. When used with a guide scope and camera, the expansion board provides “closed loop” autoguiding, controlled by the Star Book Ten itself.